"I use a fountain pen older than my grandparents"
This fall, I will be heading to college at Indiana University to study Informatics and Linguistics. As part of the tour, all prospective students participated in an icebreaker question: "What's a fun fact about yourself?" When I responded, "I use a fountain pen older than my grandparents," the response was exactly what you might expect from a group of 16/17 year old high-schoolers: utter confusion. I've been using fountain pens on a relatively regular basis for two years now. I first discovered a pack of Pilot Varsities at Staples and fell in love with fine writing utensils. Since then, I've found myself with a Lamy Al-Star, a Pelikan m205, a TWSBI Vac700, an 'infamous' Noodler's Ahab, and an azure Parker Vacumatic. (As a student in high school, I've struggled to afford much more than that.) Although my collection is meager, I can't ever imagine going back to using those free BIC pens from hotel rooms. But using fountain pens at a rural, relatively low-income high school has lent itself to a few issues in my pursuit of the hobby. "You Must Be Some Sort of Rich Momma's Boy." Yeah. That's a reaction I've gotten when I use my Vac700 at school. And no, my parents have never bought me a pen. And no, I am not rich. This reaction, however, is not unique to fountain pens. I often get the same reaction talking about App.net, Spotify, and other recurring subscriptions with free alternatives. I just think my peers struggle to grasp the concept of paying money when you don't particularly need to do so; it baffles teenagers (or at least the ones I know). I try to compare my purchasing of pens to another expensive hobby: video games. A number of my peers happily throw away $70 buying a new video game that offers 10 or 15 hours of playing time without a second doubt. A new TWSBI Vac700 runs for $80. In my honest opinion that offers a marginal price difference, especially when you take into account my peers who buy multiple games a month. On the other side of things, I do not buy pens every month, nor did I have to buy an expensive console to use my pens. Why is there such a large difference between the two? "My $0.25 BIC Pen Works Just As Well." Well, no, $0.25 BIC pens do not work as well, or at least they don't in my opinion. I struggle to explain why I just enjoy writing with fountain pens; it's nearly euphoric sitting down to write in my journal every night. I could say things like, "The words flow through my pen as easily as the ink," or, "I like all of the inks I can use, and the way I can change the thickness of the pen's line with the slightest pressure." In fact, I have tried to explain those feelings, and I'm almost immediately met with "Wow, that's dumb," or some other more colorful phrase. 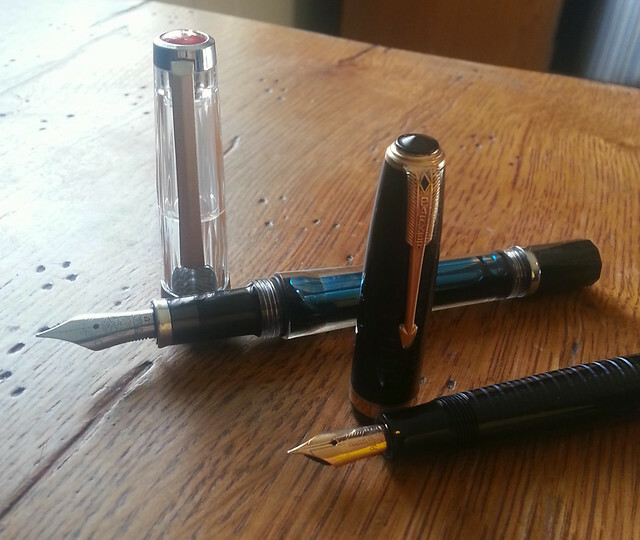 Whether we like it or not, pens are becoming obsolete, especially fountain pens. It breaks my heart that I might not be able to open a sealed, hand-written letter and enjoy communicating with people I never would have without letters, but unfortunately, I think it's the reality of the matter, and most of my peers have never been exposed to anything other than Facebook on a variety of laptops and iPads, let alone the wonders of hand-written mail. "Wow, that looks really cool!" Reactions like these are few and far between. Some just like to see the ink slosh around in the barrel of my demonstrator. Others think the nibs are pretty, or the lines graceful. I ask if they'd like to write with it, and the answer is usually yes. I hand them my pen, and they gingerly take it from my hands as if it would shatter if they held on too tightly. They take some filler paper, scribble their name and hand it back, enjoying the isolated experience. Of the dozens of people I've let try my pen(s), only one enjoyed the experience enough to ask more questions about fountain pens. I absolutely adore fountain pens, ink, paper, and even a high-quality wooden pencil or two. Most of the time, no one says anything about my pens, and when they do, my peers often look at me with confusion, completely oblivious to the wonders of such a simple technology. Posted on May 8, 2013 by Brad Dowdy and filed under Guest Post.